A little while back I posted a piece by an unknown artist, which regular readers will know I really don’t like doing, but I did it anyway because it was so unusual. When I posted the piece on my Instagram feed, a kind soul filled in the blanks for me and mentioned the artist in a comment. Brilliant, brilliant, I now know the artist to be Panskaribas (Pangiotis Skaribas) and feel somewhat pleased with myself for posting the first piece as he has an extraordinarily distinctive style. There seems to be a mash-up of picasso and 1950s cartoons going on in this piece, or at least that is what I see. I love the doodled style of the character, but feel there is a lot of sophistication to it that might be missed without a proper look. Going through my archives, I have found more pieces by Panskaribas and am instantly taken with his artwork. I look forward to seeing more of this very unusual style. Well I think we all know where Zake’s favourite place to spray his work is. I think all but one of my posts have described his work on these columns under the M32 leading into Bristol. This one is recent, and he has signed it much more boldly, unlike some of his earlier pieces which were difficult to identify. Maybe he is becoming more confident in his statements now. There is something a little ghoulish in his characters, but particularly in these two, with the white of their eyes prominent and the slightly strange idea of one of them spewing out of the mouth of the other. He seems to use the column space really well, which is a skill in itself. I only wish that I could find a good time of day to come and take pictures. I expect it would be best at night with a flash, because the bright light during the day plays havoc with the camera’s automatic settings. This Deamze burner photobombed a recent post of a Silent Hobo column, but in my view deserves a post all of its own. This writing is one of the forms that Deamze uses in his work. 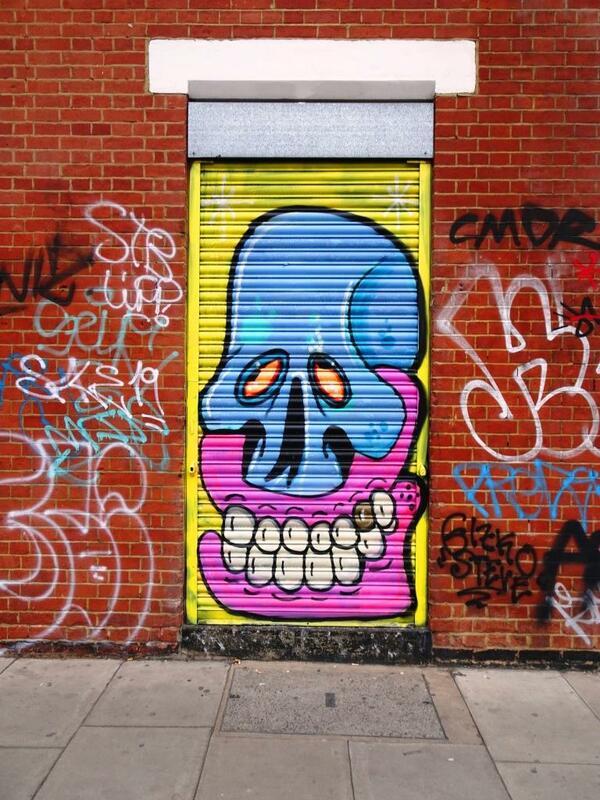 It is much simpler than his wildstyle work, but still has a clean and sharp look to it. The colours and drift of shading work really nicely and the whole thing stands out and looks so fresh. You could give a hundred artists a can and a wall and ask them to recreate this, but none would be as good. At the top of his game.